Sewing Review 2018- And Happy New Year! Hello. It is the last day of 2018. As I type this bog post, I am sitting in bed with mixed feelings. 2018 has been an interesting year for me. The most amazing thing happened in 2018, I created new life. My lovely son, Connor Jay Watkins arrived. I tried my best to hang on to my sewing. I have done some sewing this year, but it has been the bare minimum. Life has been a bit of a haze this year. Don’t get me wrong, there were a lot of good times, but also a lot of challenging times. I accept it all as my portion and I thank God for all I received, good and bad. My portion is perfect for me. Moving on to sewing. At the end of the day, as a mom of a new born, and a wife and mom of a 5 year old, my craft was really all that was truly my own. And although ideally I would sew slowly and enjoy it, my projects in 2018 (with the exception of the green kimono) were quite rushed. BUT.. I still sewed. I have always been loyal to sewing. I sew in my good times, and I also sew in my bad times. So I want to share with you what all I blogged about in 2018.. and then let’s chat about sewing in 2019. Shall we? This is my favorite make of 2018, yet the least worn. Seriously, where am I going to wear this thing? I wore it once. Lol. But loved it. Mommy and me- One of my favorite makes! And lastly, I cannot believe that I never blogged about this skirt! Its GORGEOUS!! But I did share it here briefly. Well, that wraps up 2018 sewing for me! I will continue to work on sewing. Next I am making something with a black textured double knit. I am also starting work on a custom dress form. Connor has stopped nursing and I am getting back to my pre-baby bod. I have a class in mind that I will take to get started on the dress form construction. I will share more about that in the near future. Have a WONDERFUL New Year and talk to you soon. Happy Monday!! Hope you have a wonderful and relaxing weekend. We got a winter storm and a tiny bit of snow but nothing fancy!!! My poor kid was so excited about making a snow man, but in the end she was dissapointed that all she could make was an “iceman“. Anyways, I did some fun stuff of my own this past weekend. I gave draping a try after a very long time. I am including a draping time-lapse video in the end for your viewing pleasure 🙂 I always love seeing a garment come to life! I have not draped much in the past . My preferred method of pattern making is flat pattern making. But I wanted something quick and easy this time. Draping is fun and quick. You can manipulate and maneuver the muslin with your hands and get to the design fairly quickly. You can also change the design if you are not pleased with it befoe you commit to cutting and sewing it up. I also draped this dress above with a fitted bodice and a box pleat skirt. If your garment in symmetrical, you only need to drape one half of teh garment, as your pattern will be on fold. I reviewed the Draping Basics class by Paul Gallo to refresh my memory of draping. I actually studied with Paul Gallo at Apparel Arts. He was my Fashion Illustration instructor. I actually did not know that he taught draping until I found him on Bluprint. This class is included with my subscription to Bluprint. The only thing I did not like about the class was that the sleeve was drafted on paper instead of directly on the dress forms. Sleeves can be draped directly on the dress form my simply drawing a straight line on the muslin and then taking it directly to the dress form. Since this is a draping class, my preference would be to see it draped on the dress form and skipping the paper drafting. I posted this half scale dress form on Instagram last week, and a lot of you asked where I got it. I have the Roxy half-scale dress form. I am including the time lapse of me draping the bodice sloper. To give you an idea of how quick draping can be, the total video before I created the video was 11 minutes including the bloopers. And granted this is on a small scale, I can drape a bodice on a full-scale dress form in about five to ten minutes. That’s fast! Anyways, enjoy the video. Bluprint also has a special promotion running right now, where if you purchase a Bluprint subscription, they offer 50% off all craftsy purchases, including kits and supplies! And as always, you can test drive Bluprint using their 7 Day Free Trial. Let me know if you have any questions about these offers! I am not sure exactly which class I will be watching next, but I have my eye on this cover-stitch class. I have been using my coverstitch machine straight out of the box with it’s default settings for years, and I wouldn’t mind exploring it a bit. While I was in the studio- I also recorded the highly requested video tutorial on how to cut a full circle maxi from fabric that is 45 inches wide. I will be sharing that soon, once I get caught up on work and editing!! See you guys soon and I hope you enjoyed watching the draping time lapse!! The BEST Deal of The Year For The Sewing Fashionista! Happy Friday!! Hope you have a wonderful and relaxing Thanksgiving. We spent the day at my sister in law’s house and I ate way too much! Are you indulging in any Black Friday Sales? I am typically not a shopper, but I indulged in a skin care gadget yesterday. I HAVE to share the best Black Friday sewing deals with you! Both Craftsy (where you can buy sewing classes a-la-carte’) and Bluprint (all access subscription) are offering the lowest prices of the year. These deals run now through 11/26, so don’t delay! 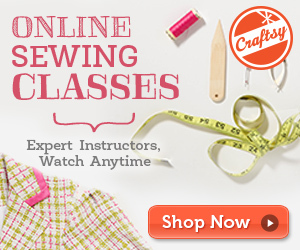 My 2nd favorite deal is on Craftsy classes, all classes are $15 or less. Both are excellent deals in my opinion. I did a review on the Bluprint platform last week. These links are affiliate links, which means they don’t cost you anything extra, but if you make a purchase, I get a small commission. These deals run now through 11/26! Happy Sewing! 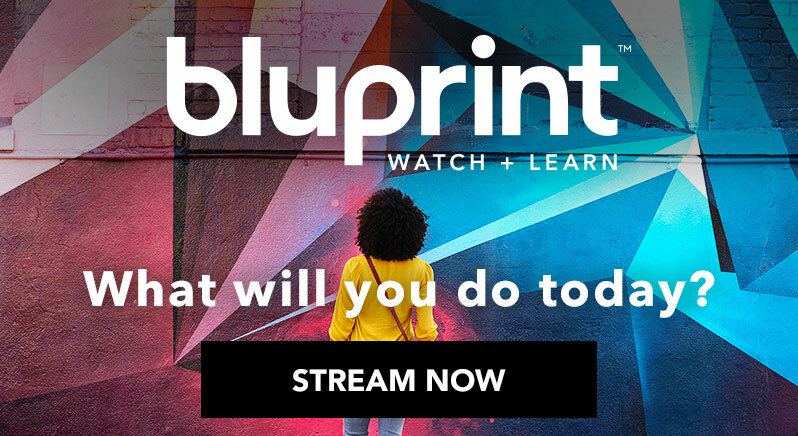 About a month ago I shared with you that Bluprint was having their “Get Started” event, where they offered you free access to all of their online classes included in their subscription. I heard from so many of you how much you enjoyed binge-watching the classes! I have been binge-watching myself, and I wanted to share with you my experience so far. For those of you who did not take advantage of the free test drive, I am doing a review of Bluprint below. I also want to let you know that you can still get a 7 Day Free Trial to Bluprint. Bluprint offers classes on various subjects, from sewing to patternmaking, to baking and woodwork! As you can imagine I am mainly interested in the sewing and pattern- making classes, and since you love to sew too, I will be sharing my experience with the classes so far. I was also super excited to brush up on my pattern making skills. For those of you who don’t know, I studied pattern making with Suzy Furrer at Apparel Arts and she is one of the instructors that teaches on Bluprint. Her classes are my absolute favorite so far! Below is my 1st impression of using this online learning platform. My goal is to learn something new each month and share my sewing projects with you! Once I logged in, I saw this screen with all the categories of classes they offer. Since I am interested in sewing classes and pattern making classes (which also fall under the sewing category), I clicked on “Sew” to browse the classes. There were a total of 197 classes available to watch! That is a lot! There is a filter option available to allow you to drill down and find what you are looking for. I found this helpful because looking through almost 200 classes can be time-consuming! The filter option allowed me to select the subcategories of “clothing” and “pattern making”. This brought me down to a selection of 35 classes, which I was able to quickly browse. Once I knew the ones I was interested in, I clicked the “+” button on the top right of the class and was able to save them to my watch library. Once you add all the classes you want to watch to your library, you can click on the library link and it shows you all the classes you have saved. Here are a few of mine. As you can see, I am interested in brushing up on my pattern making skills, and also on making my sewing more efficient by learning time-saving tips. I also want to watch the class on presser feet. I am always blown away by how the right foot can make the job so much easier. For example, I just tried out a wide hem foot and I was impressed by how it can accomplish an even hem so easily, something that would be very hard to do on my own. Now I am curious to see what else is out there that can improve my sewing. The interface is very easy to browse, and there is a large selection of classes to choose from. I also liked that a lot of the instructors were names that were familiar. For example, Kenneth King, Marcy Hariell, Susan Khalje, Joi Mahone. These are all folks who are well-known in the sewing community and I found that to be a plus. I have studied in person with 3 of the instructors: Suzy Furrer, Sara Alm, and Paul Gala. They are excellent instructors and I will be watching all their classes. The very 1st class I watched was on designing tops and in it, we went through an exercise to find inspiration to design a collection. The instructor demonstrated how to create a theme board (we called them mood boards in fashion school). It definitely got my creative juices flowing! If you have tried Bluprint, let me know what you think of it. While my main focus is going to be on improving my sewing and design skills, I also wouldn’t mind taking a yoga class once in a while, or doing some crafting! The best part for me is that I can watch whenever my schedule allows. Yesterday I watched for an hour while straightening my hair! I hope you enjoyed seeing an inside look at how the platform works, and if you did not get to test drive it during the last promotion, you can still try a 7 Day Free Trial to Bluprint. Leave me a comment and let me know what you are sewing up these days. I found this amazing boucle two-tone navy and black fabric at Joann’s fabrics a couple of weeks ago. It is so Chanel! I am planning on sewing up my Christmas look with that. In the meantime, I am working on making a wide leg pair of pants and some paci clips for Connor! See you very soon in my next blog post! categories: Behind The Seams, Mommy and Me, What I made, Who wore it best? This is probably my favorite picture from that day. I am SO in love with this little human. I just can’t believe how big she is! Anyways.. moving on to this precious mommy and me outfit. First I have to tell you that this peplum top I am wearing, almost did not make it. Confession- this top looks decent worn and styled, but from a construction standpoint, it has it issues. I made this when I was one month postpartum and I was in a complete daze. I am not even sure why I was sewing that soon after baby birth, but deep inside I guess I have this fear that if I stop sewing, I may never start again. I know that won’t happen, but aren’t most of our fears irrational anyways? Anyways… I was going to deconstruct it and turn it into a dress for my daughter, but instead, I ended up making her a dress from scratch, and decided to give this top another chance! I have to say, it has been very fun to wear! Here are a few pics of her solo. She loves her dress. Interesting fact about this fabric. It is a quilted double knit. It was kinda soft and spongy while being stable at the same time (similar to a scuba or neoprene). So what looks like piping (where the bell sleeve attaches to the sleeve, and the two tiers of the skirt attach) is actually a top stitch that makes the fabric look 3D. As you can see on the bottom tier, it is a bit of a patchwork skirt, but I have fabric greed. This is not the 1st time I have patched fabric scraps together to get as much as I can out of the yardage I have. She loved to show everyone how she can twirl. I get it. I would do the same. Her dress is completely self drafted. I played with the sleeves for a slight bell flare, and I must be in denial about how big she is getting because I eyeballed the pattern and it was too short, so I added the 2nd tier. Connor was supposed to be napping, but he made an appearance too! He is 8 months now and has a huge appetite! I feel like all I do is make his baby food and feed him! He is sitting up, eating grown-up food and almost ready to crawl! My peplum was freehanded.. let’s just say i winged it. I was so tired and sleep deprived.. but it worked out. Its a high low, higher on the sides. I do love the fullness of her skirt. The top tier is a cull circle skirt, the bottom one was cut with scraps.. so I cut strips in moon shapes, then pieced them together..
And before I let you.. please tell me, how is my little one so grown. See this mommy and me in a blue I did last time? She as such a baby! So much has changed since then, yet so much remains the same. Ok- before I get too emotional, let me go sew! I’ll be catching up with you soon as I have a few more looks to share with you!